Our DREAMING PLACE postcard project has been launched! Throughout our 40-day stay at Marble Arch Caves Geopark we are inviting people to share their Geopark dreams via postcards. 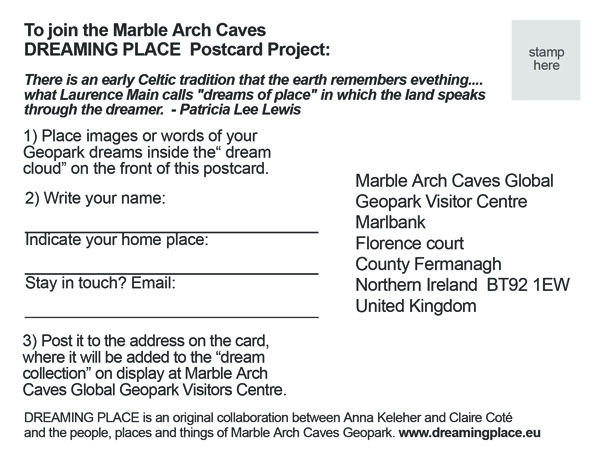 People are placing images or words of their Geopark dreams into the “dream cloud” on the front of postcards and then returning them to us to be included in a display at the Marble Arch Caves Geopark visitor center. People are even joining in the DREAMING PLACE postcard project via cycberspace! Simply download a pdf file of our “dream cloud” template by clicking here. Print out the template, draw or write your Geopark dreams on it and then return it to us by email. To return the postcard to us, take a picture or scan it and attach it to an email message addressed to: clairabell22@hotmail.com. We will print it out and include it in the display at the Marble Arch Caves visitor center. Who will send us their Geopark dreams? What an exciting project – I love your blog, and especially this combination of dreams and postcards. I hope to be able to see the display afterwards. 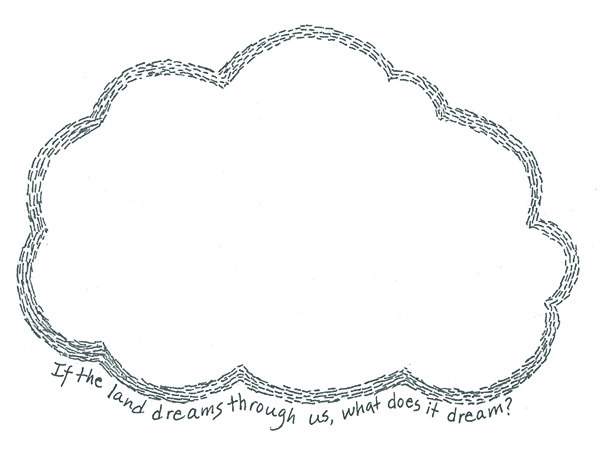 And I can’t wait to see how the land and dreams and you come together and what that makes. It is fascinating. Hiya! Thanks for your comment and interest in our project! Glad you’ve enjoyed our blog. Although our fieldwork at the MAC Geopark is now complete, we are still blogging as we process the heaps of data and experiences that we collected during our stay. New posts are going up every other day – and there is a way to subscribe by email to our blog now as well in the sidebar! I just checked out your blog as well – interesting postcard connection! Love the idea and great resource links as well! We look forward to keeping an eye on your ghost-food postcards as they evolve!